Desk Study and preliminary site work indicated that some areas of this former petrol station site were heavily contaminated with petrol and diesel. A soil vapour survey was subsequently undertaken to determine the extent of volatile contamination present. Human health Quantitative Risk Assessments (QRA) undertaken using RBCA indicated significant risks to human health from volatile contamination. Default input values within the RBCA model were adjusted to be compliant with the values set out by the CLEA methodology. QRA undertaken using ConSim also identified significant risks to an adjacent culverted watercourse. Remedial works were required to reduce risks to human health and the watercourse; remedial target values were first agreed with South Ribble Borough Council and the Environment Agency. Approximately 400 tonnes of contaminated soil was excavated and disposed of to landfill and three unknown badly corroded old cast iron petrol tanks were encountered adjacent to Watkin Lane. Petrol and diesel contaminated perched groundwater was pumped for temporary storage into 1m3 IBCs before being tankered off site and disposed of at a suitably licensed facility. The remedial excavation was subsequently backfilled with locally sourced reworked Boulder Clays following confirmatory testing. Regulator sign off obtained following submission of the validation report. Remediation works were undertaken during Summer 2007. Previous and Current Land Usage: Cotton Mill (1880-1940), a soap and cleaning products factory (1950 to 1970) and construction chemicals and products manufacturing from 1970 to present day. A former garage with an underground leaking waste oil tank had resulted in the contamination of a large volume of soils and groundwater. Following a delineation exercise and completion of quantitative risk assessments for both human health and controlled waters, soils and groundwater remediation were undertaken to clean-up levels agreed with the Local Authority and Environment Agency, principally to reduce the risks to a nearby brook. The site has since been redeveloped for residential housing. Desk study and Phase 2 site/ground investigation in Birmingham. Large residential development on a brownfield site. 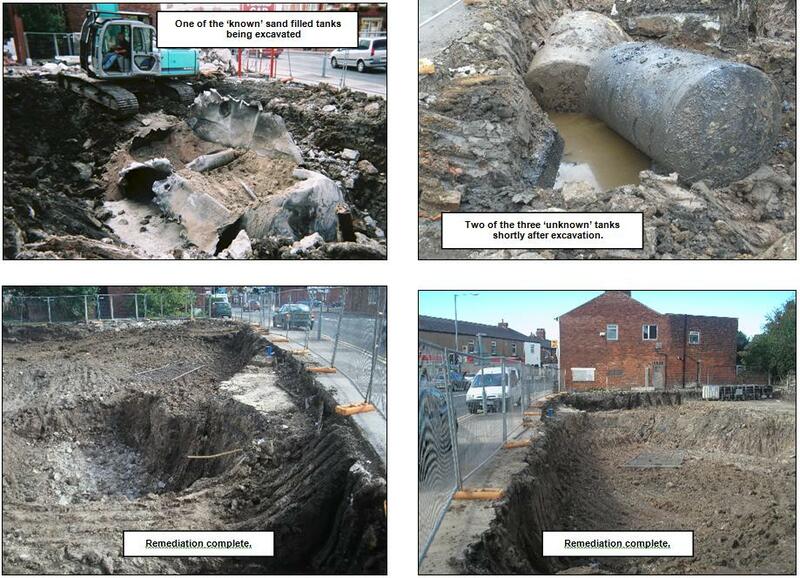 Geotechnical, ground gas surveying and contamination site investigation works undertaken. Desk study and Phase 2 site/ground investigation in London. 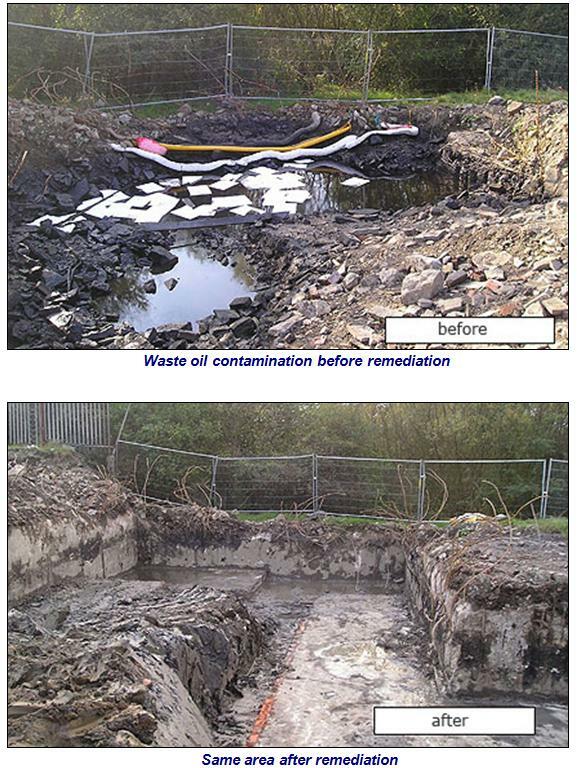 Small industrial site affected by solvent contamination which had resulted from historical tanks. Detailed human health and controlled waters risk assessments undertaken and soils and groundwater remediation required. Regulator sign off received after submission and approval of the validation report. Desk study and Phase 2 site/ground investigation in Newcastle. Former paper mill site to be developed out for residential purposes. Phase 2 works proved that no remediation necessary. Desk study and Phase 2 site/ground investigation in Leeds. Former tannery site located on the outskirts of Leeds. SIte to be developed out with offices. Phase 2 site investigation works proved significant risks to a nearby watercourse and end users of the site. Remedial works undertaken following completion of controlled waters and human health DQRA. Phase 2 site investigation in Glasgow – a former foundry site to be developed out for residential purposes. A desk study undertaken by others had highlighted several potential significant pollutant linkages to a nearby river and end users of the site. Site investigation works indicated that only a capping layer was required in garden areas to protect end users for arsenic contamination in the ashy made ground. Gas monitoring indicated that a gas membrane should be incorporated into the floorslab design to protect end users from high concentration of carbon dioxide recorded. Desk study and site investigations have also been undertaken in Cardiff, Edinburgh, Doncaster, Sheffield, Bristol, Clacton-on-Sea, Chester, Southampton, Warrington and Stoke-on-Trent. The Land Consultancy Limited undertakes works all over the UK at extremely competetive rates.